Any beauty products that get the thumbs up from Sali Hughes are well worth adding to your shopping list. 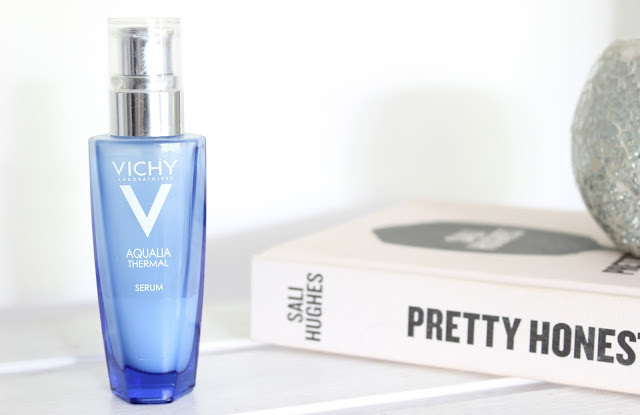 And the Vichy Aqualia Thermal Fortifying & Soothing 24hr Hydrating Care Serum (the longest name in the history of skincare) along with my Good Things Manuka Honey Daily Moisturiser, has helped to eradicate all my dry patches. Before I get onto the fundamentals, I have to mention the packaging - isn’t it pretty? The blue and silver glass bottle is not only pretty, but practical with a pump making it easy to dispense product, reducing waste. The serum although a little runny in texture, has a fab formula. It’s lightweight, hydrating, refreshing, not at all sticky or greasy and mildly fragranced which hasn’t as of yet caused any issues. I use one pump after cleansing and before moisturising and the serum glides onto my skin and immediately takes away that tight feeling. My skin appears plumper and lines are visibly smoother after one use. This serum is powerful enough to be used in place of a moisturiser and works incredibly well under makeup. It’s reasonably priced too at just £19.99. So if you have dehydrated skin, add this product to your shopping list.